This is the next step in a challenging task that began nearly 300 years ago. The United States’ last frontier, the largest state, the land of superlatives: in spite of achieving statehood 52 years ago, Alaska does not yet have adequate base geographic information for the entire state. A major element in the foundation for the framework of base geographic data is to map and acquire imagery of an accuracy and resolution high enough to meet most user needs. This is essential for continued economic development, livability, and public safety. The Alaska Statewide Digital Mapping Initiative (SDMI) is working to remedy the state’s lack of base geographic information. As part of its mission, the Alaska Department of Natural Resources (ADNR) has awarded a multi-year $3.45 million mapping contract to AeroMetric, Inc., teamed with SPOT Image and Fugro EarthData, to provide satellite-based 1:24,000 orthoimagery of the entire state. John Oswald & Associates and CompassData are also members of the production team. The SDMI is a cooperative state program being implemented by the University of Alaska and the six state of Alaska departments: Natural Resources, the Department of Military and Veteran’s Affairs, Fish and Game, Environmental Conservation, Transportation and Public Facilities, and Economic Development. SDMI sees its long-term roll as accommodating anticipated advances in mapping technology and delivering the products of those advances to the user community. The immediate mission of the Initiative is to produce two product lines: a new statewide orthoimage at 1:24,000 National Map Accuracy Standards (NMAS, 12.2-meter CE90) and a new statewide digital elevation model (DEM) at 20-foot contour accuracy (3-meter LE90.) This article addresses the statewide orthoimage being produced; to that end, in August of 2010, the Alaska Department of Natural Resources entered into the contract with the AeroMetric team to provide imagery and processing for the 1,561,622-square-kilometer project area using 2.5-meter, multispectral SPOT 5 imagery and a DEM assembled from best available sources to allow orthorectification to the 1:24,000 NMAS requirement. The new orthoimagery created under this contract will provide a common layer showing current conditions and trends over the Alaska landscape. Once the data is gathered, it will allow other types of geographic information to be extracted and registered. Alaska agencies and private organizations will then be able to better use geographic information systems (GIS) and mapping technology as an aid in responsible decision making. Although not a deliverable under this contract, the state hopes to acquire refreshed imagery every three to five years and to extend the coverage to include the three-mile territorial waters of Alaska and the U.S. Exclusive Economic Zone (EEZ), which extends 200 miles offshore. This is the latest step in the process of mapping Alaska, which began nearly 300 years ago. 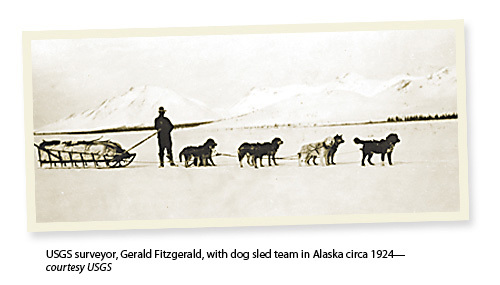 Writing in 1950 for the U.S. Geological Survey in the Proceedings of the Alaskan Science Conference, Gerald FitzGerald described “four significant periods in the history of exploration, surveying, and mapping in Alaska.” He went on to describe the first hundred-year period, the Russian occupation, as beginning in 1728. That time consisted mainly of maritime exploration and charting of coastal areas by England, France, Spain, Italy, and Portugal. While the name of Vitus Bering, the Dane who explored for Russia, is well known, the lion’s share of the exploration and charting in this period was performed by English navigators of note but not often associated with mapping the wilds of Alaska: Cook, Vancouver, Beechey, Franklin, Dease, and Simpson. Mr. FitzGerald described the second period as beginning with the purchase of the territory in 1867 and continuing through 1895. This time is characterized as being marked by continued coastal mapping by the U.S. military and the Coast and Geodetic Survey (the predecessor of the NOAA and the National Geodetic Survey). 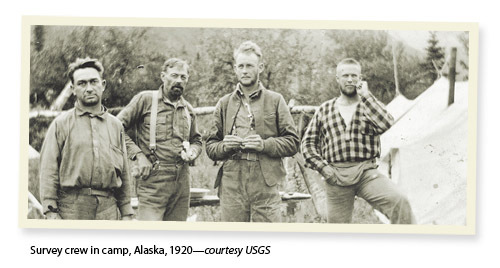 He concluded that the third period, between 1895 and 1940, was the beginning of “organized and systematic mapping and charting in Alaska—principally by the U.S. Geological Survey and the Coast and Geodetic Survey.” A host of other agencies and private organizations contributed as well. The fourth and final era in Mr. FitzGerald’s 1950 report included World War II and the immediate postwar years. During the war, trimetrogon (three-lens camera) aerial photography was used in Alaska by USGS and the Army Air Forces for mapping and aeronautical charting. After the war Navy photo squadrons returned to Southeast Alaska to obtain new photography with single lens precision mapping cameras. Later still, the Air Force photographed the principal transportation routes leading into the interior of the territory. This photography was controlled by short-range navigation (SHORAN), an electronic method used to determine geographic positions within the area photographed. If he had continued numbering the Alaska surveying and mapping epochs it is difficult to say what his number for our current era would be. Whatever number, the job is far from complete. 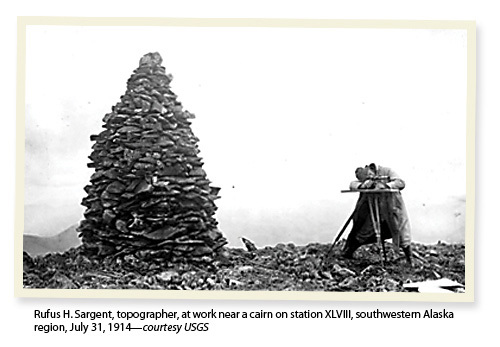 Modern technology has enabled great strides in acquisition of data and imagery in the near 60 years since Gerald FitzGerald submitted his report commissioned by the U.S. Geological Survey. 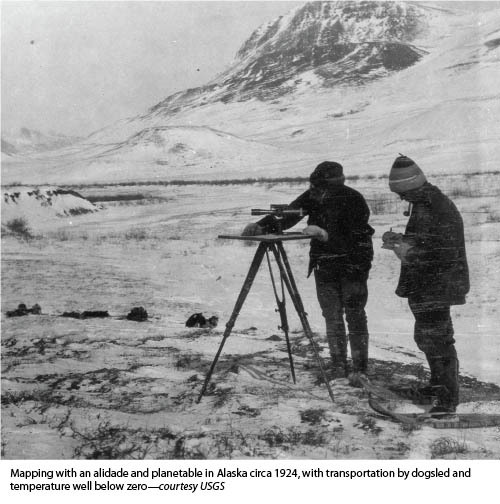 From the time of that report to the present the USGS has completed 15-minute mapping at 1:63,360 (1”=5280’) of all but 3% of Alaska; however most of that mapping was never produced to NMAS. A relative handful of the familiar 7.5-minute sheets at 1:24,000 have been completed for built-up areas around Anchorage and Fairbanks, but only the small scale 1:250,000 series of topographic maps are 100% complete for the state. When I was first using USGS quadrangle maps in the 1960s the Alaska quadrangle sheets were still relatively new, but they offered neither fine detail nor adherence to National Map Accuracy Standards. 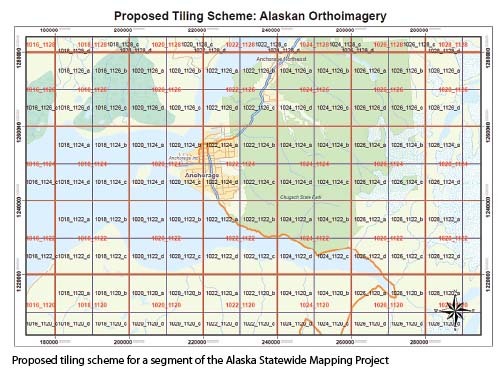 Reliance on a 1:250,000 scale quadrangle map on the Alaska Peninsula for daily use was the genesis of a career-long quest to participate in a statewide mapping program to provide Alaskans with maps of improved quality and content. The Alaska High Altitude Aerial Photography Program (AHAP) provides the most recent near-statewide moderate resolution imagery currently available. It was acquired between 1978 and 1986 and includes black-and-white and color infrared images. Between 10 and 25% of this coverage has been orthorectified, but it does not comply with National Map Accuracy Standards. In addition to AHAP, numerous agencies routinely acquire imagery in Alaska. These include the State of Alaska Department of Commerce, Community & Economic Development (DCCED), National Resources Conservation Service (NRCS), U.S. Forest Service, U.S. Census Bureau, U.S. National Park Service, State Forestry, and USGS/BLM in the National Petroleum Reserve-Alaska (NPR-A), which are all involved to some extent in o rthoimagery collection in Alaska. However, all these groups are regional rather than statewide in scope. The USGS and the National Geospatial Intelligence Agency (NGA) have a program that provides high-resolution orthoimagery covering major metropolitan areas and state capitals in the lower 48 states at resolutions of 6 inches to 1 foot. This digital imagery is the foundation of many private and public geographic information systems and provides the base for the USGS National Map. This same coverage was obtained for Anchorage in 2002 and 2006, Juneau in 2007, and Fairbanks in 2009. The resolution ranges from 0.3 to 1.5 meters and was funded jointly by the USGS and local municipalities. The National Agriculture Imagery Program (NAIP) is a digital orthoimagery product produced by the United States Department of Agriculture (USDA) using private contractors. Alaska is generally excluded from NAIP, but some USDA funds have been channeled to local communities for imagery acquisition through NRCS. Acquisition is not limited to just government agencies and programs. Several of the large Alaskan native regional corporations have acquired regional imagery and lidar data for DEM. Some are investigating the acquisition of satellite imagery as well. Private geospatial firms, including AeroMetric, Inc., maintain extensive photo imagery archives and provide geospatial and imagery services to public and private sector clients throughout the state. In 2006, the SDMI was formed and the long- and short-term goals determined. In August 2008, Alaska sponsored a joint meeting of the National Digital Elevation Program and National Digital Orthoimagery Program. SDMI managers also directed planning contracts, surveys, multiple presentations, and two technical workshops: one on elevation and one on imagery. Each workshop resulted in a published whitepaper. In November 2009, the SDMI entered into a partnership with federal partners representing the National Geospatial-Intelligence Agency, USGS, Bureau of Land Management, USDA Natural Resources Conservation Service, and National Park Service. The purpose of the partnership has been to collect mid-accuracy (6-foot RMSE-z) DEM for the state. This collection is occurring in phases. The first phase is the collection of 20 one-degree geocells that began in 2010. SDMI managers are continuing to work with federal managers to develop an active mapping partnership with federal programs for the state. These partnerships will lead to meeting multiple objectives: completing the statewide mid-accuracy DEM; acquiring data of higher spatial resolution and accuracy where needed in areas such as cities, villages, and transportation corridors; and refreshing orthoimagery data on a routine, less than 3- to 5-year basis, much like the NAIP program does in the contiguous 48 states. For the line being produced under the SDMI contract, the project area covers 1,561,622 sq km and includes a 1-km buffer along the coastline. The project is expected to produce a variety of deliverables wrapped around a baseline of the state, being divided into 4,387 tiles, each covering 20,000m by 20,000m (8,000 pixels x 8,000 pixels). Among the deliverables expected will be a project-management plan that includes team organizational initiatives. There will also be source imagery, metadata, orthomosaic imagery tiles, natural color and panchromatic with metadata as well as color infrared with metadata. Along with other items such as project horizontal and vertical control, quality control reports, and production files, this represents a shift in mapping accuracies heretofore unseen in Alaska. 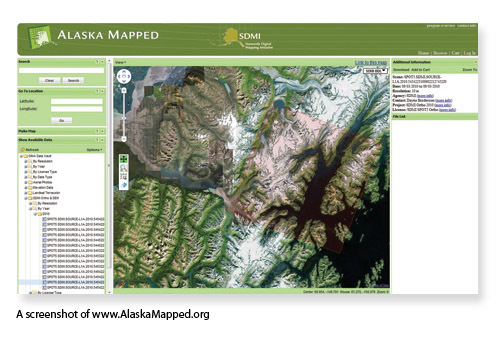 The delivered geospatial data will be hosted at the www.AlaskaMapped.org website by the Geographic Information Network of Alaska resident at the University of Alaska Fairbanks. Comprehensive ground control is critical to the quality of the SDMI orthoimage deliverables. Over the past six years, AeroMetric has acquired over 40,000 airborne GPS/inertial measuring unit (APGPS/IMU) controlled images in its film archive. This information will be incorporated with ground survey data to provide the horizontal and vertical control for orthorectification. Horizontal control reports and information about the utilized DEM will be delivered with each batch of orthorectified tiles. DEM evaluation and preparation, quality control, and project reporting will be also be performed by AeroMetric. The new imagery will be collected by a sensor that uses two high-resolution geometry (HRG) instruments aboard the SPOT 5 satellite, which will provide homogeneous spatial and radiometric statewide coverage. The acquisition strategy is to collect imagery of all of upland Alaska with a one-kilometer buffer within the required timeframe of four to five years, beginning with 2009 archive imagery. Spot Image will deliver the data sets used to generate the 2.5-meter statewide orthoimage products. 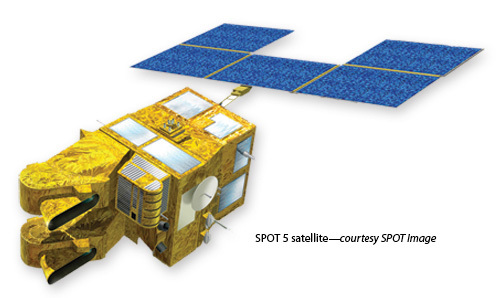 The SPOT 5 satellite, launched in May 2002, has been providing multispectral (MS) and panchromatic (PAN) imagery since mid-July of 2003. SPOT Image is the commercial operator of the system. The satellites were developed by the French Space Agency (Centre National d’Etudes Spatiales) in partnership with several European governmental organizations and public and private entities. The 2009 archival imagery and the 2010 new collection will cover more than 37% of the statewide project area. Fugro EarthData will process the digital SPOT 5 data bundles in conjunction with control and DEMs furnished by AeroMetric using their Pixel Factory processing suite to derive seamless orthoimage tiles (natural color and panchromatic and color infrared) with 2.5-meter pixel resolution. For areas in which existing DEMs are of sufficient accuracy, orthoimage products will meet the geographic accuracy objective of at least the NMAS of 1:24,000, where 90% of the horizontal points on the map are within plus or minus 40 feet horizontal distance (12.2 meters) of their actual position on Earth. Areas not meeting the NMAS accuracy due to poor quality DEMs will be flagged and reported to DNR for future re-processing when higher accuracy DEMs become available. There is an increasing demand for timely and reliable geospatial information across our country, and especially in northern latitudes due to the apparent acceleration of climate change. By entering the multi-year contract to provide statewide 1:24,000 orthophoto tiles, the Statewide Digital Mapping Initiative has taken another important step in providing higher quality data, enabling scientists, planners, policy makers, and developers to make informed decisions. The project website provides further information. Anthony B. (Tony) Follett, CP, RPP, PPS is senior vice president and Alaska region manager for AeroMetric, responsible for operations in Alaska and Western Canada. Since 1973 he has been involved in design and management of over 1,500 geospatial projects including work in Canada, Latin America, and former USSR countries. A member of ASPRS since 1968, he is an ASPRS Fellow, received two Presidential Citations, and is past president of the Alaska Region. He is also a past president of the Management Association of Private Photogrammetric Surveyors (MAPPS). He is Chairman of the Export Council of Alaska, a Commissioner on the Municipal Airports Aviation Advisory Commission, and a member of the UAA Advisory Boards for the School of Engineering and Department of Geomatics.